Newcastle boss Rafael Benitez existing deal is due to expire at the end of the season and while he wants to stay and the Magpies want to keep him, no agreement has yet been reached. However, it is understood significant talks have taken place in recent weeks and Benitez has now confirmed that he is awaiting an answer from the club on his proposals for the way forward. He said: "They were coming with something, we are coming with something, that's it. The ball is in their court. "It was (managing director)Lee Charnley with my people. I will not talk too much about that. You have the clarification. The ball is in their court." Benitez's comments came after a report from France suggested he had engaged an agency to help him find a Ligue 1 club with his future on Tyneside unresolved. However, he insisted claims that he had attended a meeting across the English Channel on March 6 were not true, and that Newcastle remain the only club with which he is in dialogue. He said: "I didn't have any meetings because I was here until late. The only club I'm talking to about my future now is Newcastle United and I'm waiting for an answer." 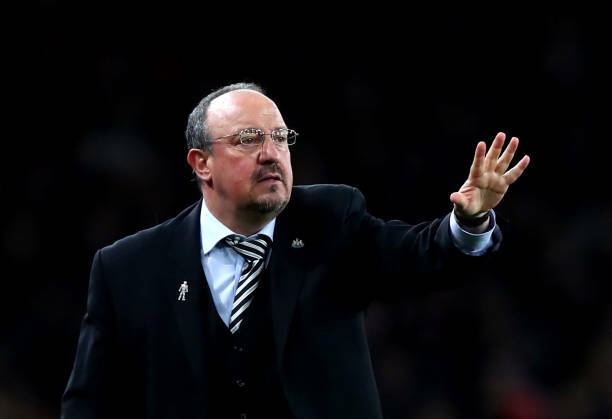 Newcastle fans are desperate for Benitez to commit his future to the club after three years during which he could not prevent them from being relegated, but won promotion back to the Premier League at the first attempt and then guided them to a 10th-place finish last season. A sixth successive home victory, something the Magpies have not achieved since the 2003-04 season under Sir Bobby Robson, over Crystal Palace on Saturday would take them to 38 points for the campaign with five games remaining and within six points of their final total 12 months ago. That would increase the clamour for a deal to be struck, although owner Mike Ashley will have to provide his manager with assurances over his ambition after failing to find a buyer who can fund a more progressive approach, something the sportswear magnate insists he cannot afford to do. Asked how much encouragement supporters should take from his comments, Benitez said: "At the moment it's very clear: the only conversation I have is with Newcastle."